This past week, my brother and I decided to venture just up the hill to Shaker Square. I had seen Fire Food and Drink many times, being from the area, but I never tried to make a reservation. I had heard that the place can be pretty packed in the evenings. 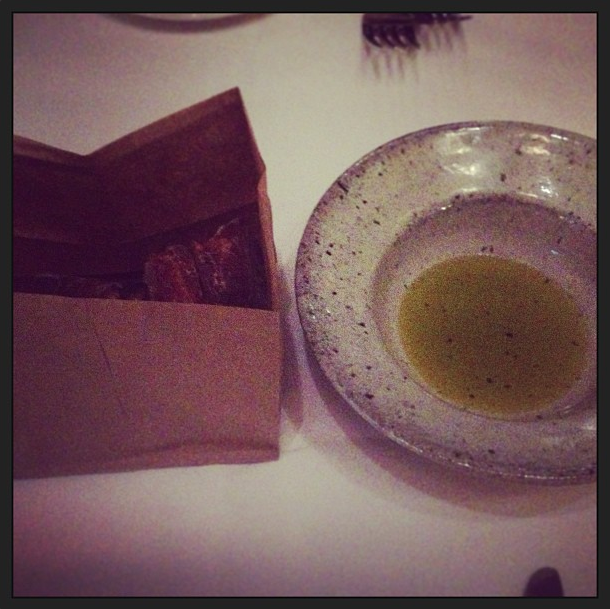 However, we managed to make an online reservation within an hour of our dining time. The dress is business casual, so I had to convince my little brother to ditch his athletic shorts for a pair of khakis before driving up. A valet took our car for us as a complimentary service to our dinner. Inside, our coats were checked and we were immediately taken to our table. There was a special meal deal (prix fixé) for Cleveland Restaurant Week by the Cleveland Independents (see more about this under the Green Initiatives section), a $33 three-course meal that my brother selected. I chose to select a number of other dishes. Our order was taken quickly and we were surprised by how casual our waiter was with his language and humor. I personally liked the way his informality contradicted the pristine atmosphere and dress restrictions of the place, but I could see how others might find that offensive. The restaurant itself is in a unique, open room with windows facing the Square. The chefs are visible to the customers as they cook over an open fire. The floors are hardwood and there is little clutter apart from the furniture crammed into the relatively small space. The tables are very close together, with little divisions beyond a periodic column. The lighting is very dim. My brother joked, after washing his hands in the restroom, that the artwork decorating the sinks was photos of faucets nicer than the ones in the actual sink. First, we were poured water and given olive oil and wholegrain bread – a trend I have noticed across most locavore restaurants in Cleveland and beyond. We were also informed of all the changes to the menu. There was a substitute for some of the fish kinds and other ingredients due to shortages and availability. Fire Food and Drinks supplies locally from the North Union Farmer’s Market and participants. 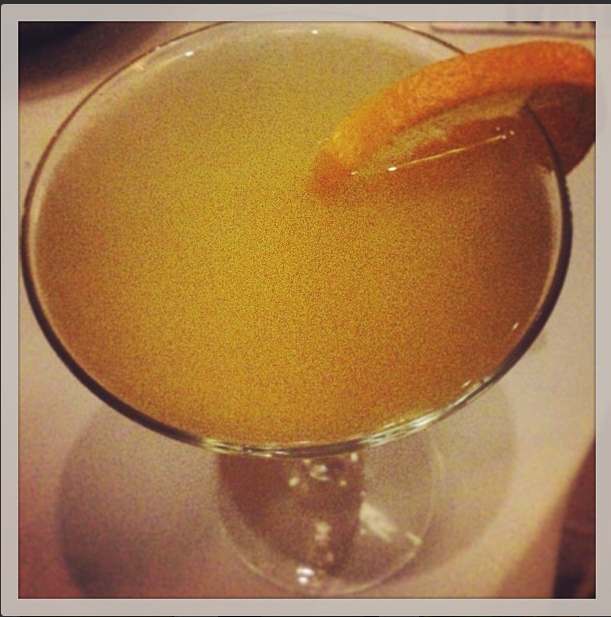 I ordered an orange martini from the drink menu (which is not complete on their website). I split the artisanal cheese plate appetizer with my brother. 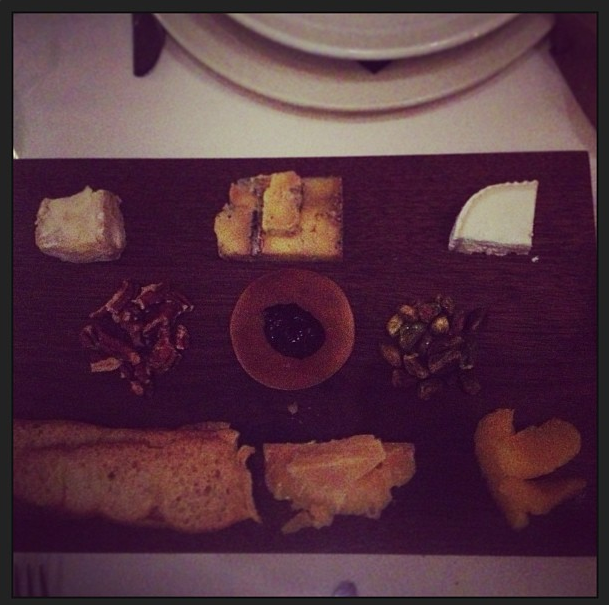 It came with “seasonal” fruit (orange slices), nuts, jam, and crustades, and four kinds of cheese. Two were soft, two were firm, and none were identified to me. I did, however, recognize one as a brie and one as a goats’ milk base. Again, this seems to be the standard in my experience at Cleveland restaurants with locavore food and cheese platters. The nuts were pecans and pistachios. 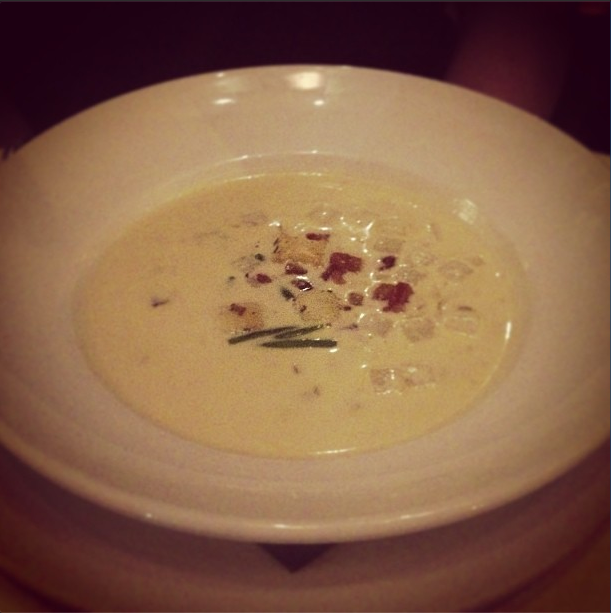 My brother’s first course included his choice of the clam chowder soup (Penn Cove Manila) with Yukon potatoes, oyster crackers, and chives, topped with bacon. (The alternative was a roasted beet and radish salad with tangerine-mustard vinaigrette, chickpease, local goat feta, and tarragon.) It was very good, although the bowl was extremely shallow. There was much less in his bowl than what appeared to be there. For our main courses, I had the goat cheese agnolotti (basically, ravioli). The sauce is defined as a “meyer lemon cream sauce” and it is served with pine nuts and “winter greens”. These greens were probably some kind of kale, a popular winter crop in the area. 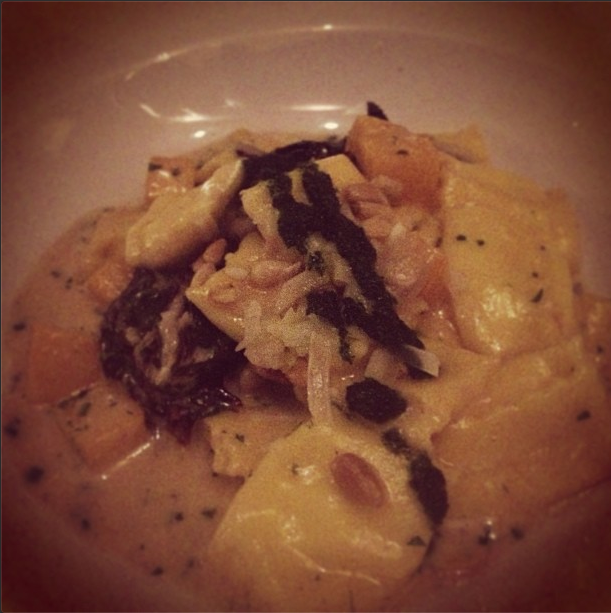 The agnolotti were extremely creamy, delicious, and rich – almost too rich to have many. The serving, however, was tiny considering the $19 meatless expense. If you like goat cheese, I definitely recommend this dish. It’s not spicy or sweet, but simple and complimentary to the flavor of the cheese. 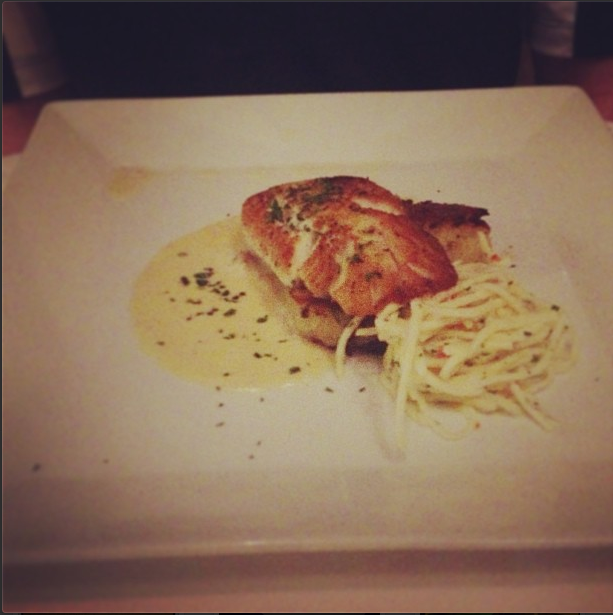 My brother’s second course was a fish with a side of seasoned spaghetti and a light sauce. The original restaurant week menu describes this as a “Pan Seared Maine Haddock”, coated with crispy Roesti potato, accompanied by a celery root-Meyer lemon slaw, and topped with a creamy Soubise. (The alterative was “Braised Shortribes”, served with creamy polenta, pickled cabbage, golden raisins, sautéed spinach, and shallots. The local crops are evident in this dish.) I did not try the fish dish, but I know he liked it – and yet its portion size did not come close to filling him. Finally, the third course came: a blood orange tart. (The alternative was a choclate coffee and whiskey “Cappuccino”, made with chocolate cream, espresso-whiskey granite, and whipped cream. My brother had no interest in the alcohol, being underage, and I had my martini already, thus we opted for the tart.) 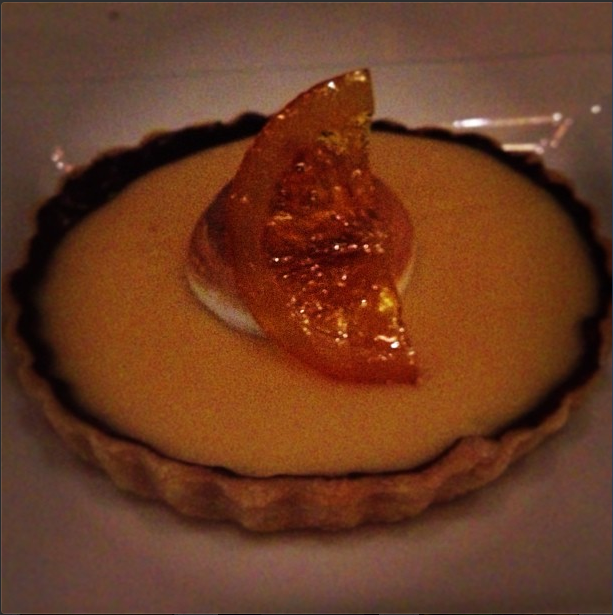 The tart was decorated with toasted meringue and a candied orange slice. The dark chocolate blood orange cream filling was more like a pudding than we were expecting, but the crust was light and soft. The dish was not too sweet to finish. The standard dessert menu includes things like ginger crème brûlée, mousses, apple tart, and even a popcorn ice cream sundae, reminding me of the popcorn appetizer at Market Garden Brewery. 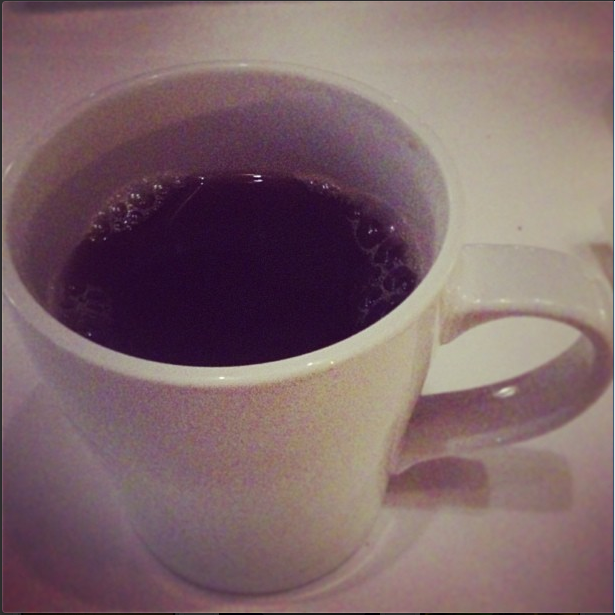 I had a cup of coffee to go with the dessert. 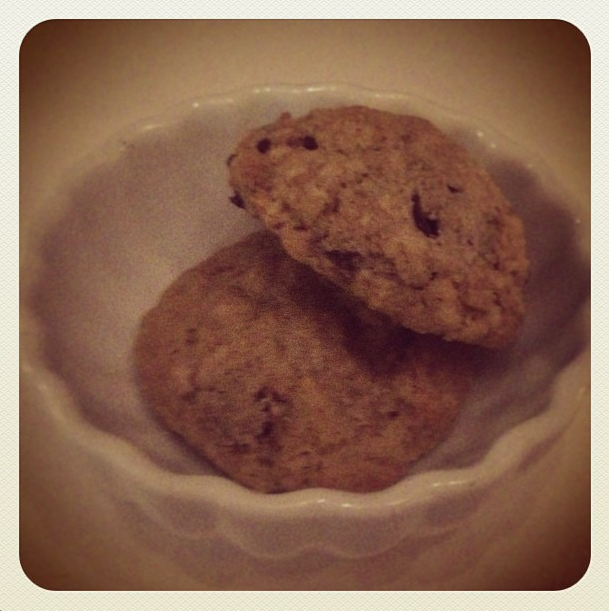 With the conclusion of our meal and the presentation of our bill, our waiter gave us two tiny, spiced, chocolate-chip cookies. It was a nice surprise. The chocolate was very rich, like most of the ingredients we experienced throughout the meal. PROS: I really like that this Shaker Heights restaurant buys its ingredients from the North Union Farmer’s Market and that it changes its menu as supplies change. I also liked the variety of the menu considering its simple ingredients, as well as Fire’s ability to not overwhelm the senses in a single dish. The service was fast and friendly, and the seating was not uncomfortable. CONS: Our bill came out to be about $100 with the tip. Had the portions been more generous, I could have understood. I feel like this place is a little overpriced, despite its strides to provide a decent price for good food. I would also like to see a few more vegetarian options on the entree menu. Lastly, I wish Fire would better promote itself on its menu. I feel like a cover page with an introduction on who they are and what they do would serve them better than the bare-minimum look their menu currently has, with only one line dedicated to their locavore service. 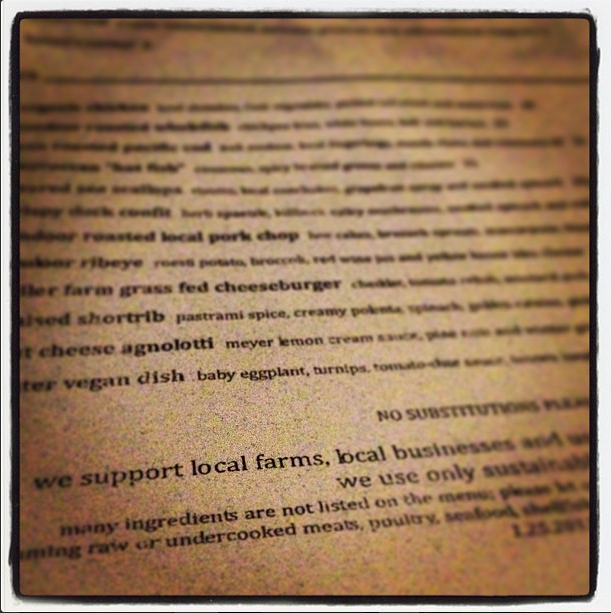 I would definitely recommend trying this place out to locals interested in promoting the locavore revival in Cleveland. It would be interesting to hear back from others on their experiences as well! Fire is open open Tuesday through Sunday for dinner and Saturday and Sunday for brunch. Visit http://firefoodanddrink.com/about/ for more information. I get the impression that this market is extremely busy on a regular basis, but it was packed this Saturday (holiday weekend). The market at Shaker Square is open Saturdays from 8am to 12pm, the outdoor vendors running from April to December before moving indoors according to the website.